Quentin Tarantino once said that directing is a young man’s game. And over and over again he is proven wrong. Robert Altman (M*A*S*H, Nashville) was still going strong until his death last year at 81. Clint Eastwood continues to churn out masterpiece after masterpiece at 77, last year coming out with the breathtaking double-whammy of Flags of Our Fathers and Letters from Iwo Jima. Now, Sidney Lumet (Network, Serpico), at 83 years young, has crafted a stunning new thriller that actually bears a passing resemblance to Tarantino’s own Reservoir Dogs. In fact, Before the Devil Knows You’re Dead does Reservoir Dogs one better. It is a taut, electrifying heist thriller that focuses on the physical, psychological, and emotional ramifications of a robbery gone wrong, and the dramatic ripple effect caused by bad choices. Like Dogs, Devil tells its story from multiple points of view, tripping back and forth in time as we watch the characters’ collision course for disaster. 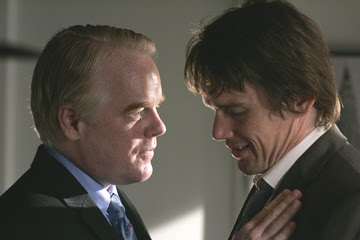 There are the two brothers, Andy and Hank (Philip Seymour Hoffman and Ethan Hawke) who plot to rob their parents’ jewelry store in a seemingly victimless crime. But things go horribly wrong, and their lives spiral out of control as their father (Albert Finney) seeks out to find out who was behind the robbery. It is a film of uncommon intensity, but there is surprisingly little action. The film’s power derives from the consequences of the characters actions, which become increasingly dire. Lumet directs with the energy and verve of a man a third of his age. It is an explosive work, filled with towering performances and razor sharp dialogue. Ethan Hawke, in particular, has never been this good before. 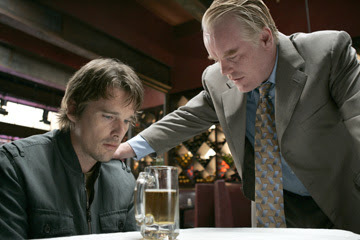 His slow, guilt-wracked meltdown is nothing short of sensational, and Hoffman’s portrayal of a man whose sins have finally caught up with him is one of his most accomplished. This is the kind of impressive ensemble work that should warrant a Best Ensemble Cast category at the Oscars…until then I hope to see it nominated by SAG, I haven’t seen a better acted film all year. It all adds up to one thundering cinematic work - an absorbing, intelligent drama of the highest order. Lumet hasn’t lost his edge, proving he is still one of the masters, and reminding us why he is a master to begin with. 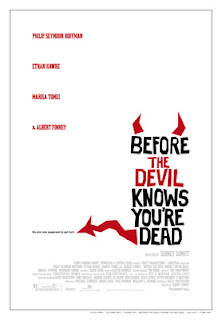 In Before the Devil Knows You’re Dead, he shows great eye for detail, as well as a no-nonsense style that keeps the film tense and focused - this is a lean, mean piece of work, with all the edge and bite of a master with the maturity and experience of an old man, and the eye and energy of a young man.